The first season of Jamie Oliver’s Food Revolution wasn’t a big ratings success but ABC liked them well enough to order another round. Season one averaged a 1.8 rating in the 18-49 demographic and 5.11 million viewers. We’ll have to wait until April to see if season two performs better or worse. In the Season Two premiere, “Episode 201,” Jamie is raising the stakes for his Food Revolution by bringing it to one of America’s biggest cities, Los Angeles, but almost immediately has to rethink his approach when the Los Angeles Unified School District (LAUSD), the nation’s second largest school district, slams the door in his face. Jamie’s first order of business — to win the support of the parents and teachers in hopes of appealing the LAUSD decision to lock him out of the school lunch program. He opens a kitchen in Westwood, where he hopes to provide educational tools to combat the obesity epidemic, and attends a school lunch convention, where he discovers a seminar advocating flavored milk in schools. Jamie stages a dramatic demonstration, but it falls short with the community, then attempts to create a healthy fast food menu in a local drive thru restaurant. Can the Revolution be saved? “Jamie Oliver’s Food Revolution” is produced by the Fresh One Productions and Ryan Seacrest Productions. Executive producers are Jamie Oliver, Ryan Seacrest, Craig Armstrong, Adam Sher and Roy Ackerman. In the past five years Jamie Oliver has been on a mission to get people healthier by cooking with fresh foods. His Feed Me Better campaign in the United Kingdom led the British government to add $1 billion into the school food budget and, more recently, his Food Revolution campaign in the United States collected more than 650,000 signatures and helped pass the Healthy Hunger Free Kids Act of 2010. 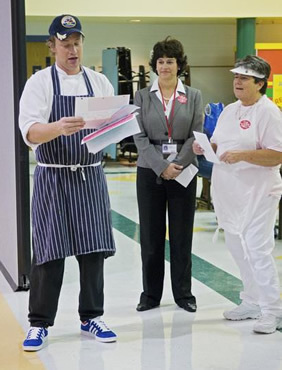 “Jamie Oliver’s Food Revolution” is loosely based on Jamie’s U.K. series, “Jamie’s Ministry of Food” and “Jamie’s School Dinners,” which changed what British schoolchildren are fed in school. In America, Jamie’s turning his attention to helping people of all ages change their eating habits by learning to cook and choosing fresh food over processed in schools, homes, workplaces and even restaurants. Jamie Oliver’s other U.S. television credits include “Oprah’s Big Give” for ABC and “Jamie at Home” and “Jamie’s Food Escapes” on the Cooking Channel. He is the author of ten popular cookbooks, including the New York Times bestseller, Jamie’s Food Revolution: Rediscover How to Cook Simple, Delicious, Affordable Meals, which Hyperion will release in paperback on April 5, 2011. More about: Jamie Oliver's Food Revolution, Jamie Oliver's Food Revolution: canceled or renewed? don’t you get it…he’s trying to bring healthy eating to me and our kids…that can only be a good thing.